On July 14, 2012, Roscosmos cosmonaut Yuri Malenchenko, NASA astronaut Sunita Williams, and Japan Aerospace Exploration Agency (JAXA) astronaut Akihiko Hoshide will depart for the International Space Station aboard Russia's Soyuz TMA-05M spacecraft from the Baikonur Cosmodrome in Kazakhstan. The three crew members will arrive at the station on July 16 to join cosmonauts Gennady Padalka and Sergei Revin and astronaut Joe Acaba, who have been aboard the orbiting laboratory since mid-May. Expedition 32/33 (Suni Williams, Yuri Malenchenko, Aki Hoshide) qualification training simulation runs at Star City, Russia. 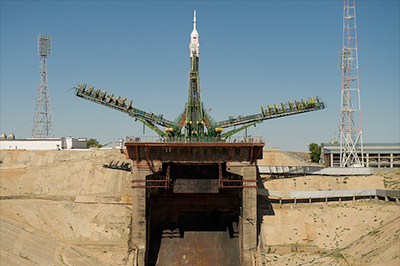 See here to discuss the Soyuz TMA-05M mission to the space station. Expedition 32/33 Soyuz commander Yuri Malenchenko, NASA flight engineer Suni Williams and flight engineer Aki Hoshide of the Japan Aerospace Exploration Agency conducted qualification training at the Gagarin Cosmonaut Training Center in Star City, Russia on June 19 and 20, 2012 in advance of their final approval for their launch to the International Space Station. 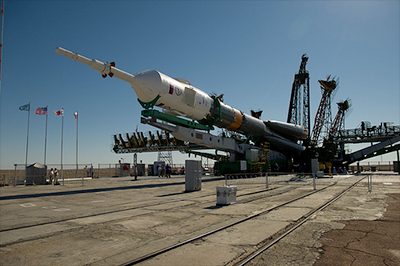 Malenchenko, Williams and Hoshide are scheduled to depart for the launch site at the Baikonur Cosmodrome in Kazakhstan on July 2 to prepare for their July 15 liftoff in the Soyuz TMA-05M spacecraft. Also in this footage are backup crew members Roman Romanenko, Chris Hadfield of the Canadian Space Agency and NASA astronaut Tom Marshburn. TMA-05M commander Yuri Malenchenko, NASA flight engineer Suni Williams and flight engineer Aki Hoshide of the Japan Aerospace Exploration Agency participated in a variety of activities from July 2 to 10 as they prepared for launch to the International Space Station from the Baikonur Cosmodrome in Kazakhstan on July 15. This footage includes the crew's arrival, suited and unsuited fit checks in the Soyuz spacecraft, raising of flags outside the Cosmonaut Hotel crew quarters and other traditional activities. The video also features backup crew members Russian commander Roman Romanenko, Canadian Space Agency flight engineer Chris Hadfield and NASA flight engineer Tom Marshburn. 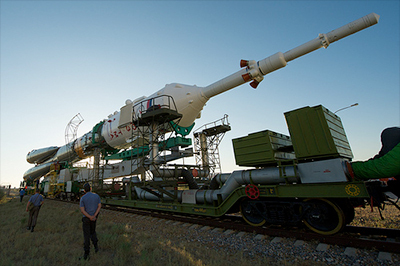 The Soyuz TMA-05M spacecraft was mated to its booster rocket at the Baikonur Cosmodrome in Kazakhstan on July 11 as part of final preparations before launch to the International Space Station on July 15. 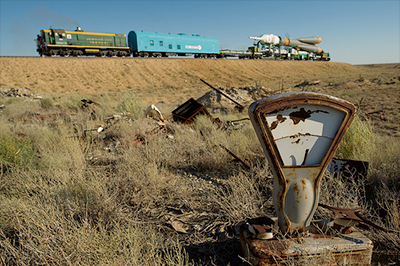 The Soyuz TMA-05M spacecraft was rolled out by train and erected on its launch pad at the Baikonur Cosmodrome in Kazakhstan on Thursday, July 12, 2012. Nearly 40 years after the launch of the first international space mission, a crew of three veteran space travelers from three different countries embarked on Saturday (July 14) for the International Space Station. Russian cosmonaut Yuri Malenchenko, US astronaut Suni Williams and Japan's Akihiko Hoshide lifted off on board Russia's Soyuz TMA-05M at 10:40 p.m. EDT (0240 GMT) from the Baikonur Cosmodrome in Kazakhstan. At the launch site, it was 8:40 a.m. on Sunday (July 15), coinciding with the 37th anniversary of the Apollo-Soyuz Test Project (ASTP). The 1975 mission brought together American and Soviet spacecraft for an "orbital handshake" between the early Space Race competitors. Flying under automated control, Russia's Soyuz TMA-05M spacecraft docked at the International Space Station's (ISS) Rassvet module at 11:51 p.m. CDT on Monday, July 16 (0451 GMT July 17) while flying over northeast Kazakhstan 252 miles below. "Everything is perfect," Soyuz commander Yuri Malenchenko radioed to Russia's Mission Control Center in Korolev, just outside Moscow, describing the docking. After the hatches between the Soyuz and space station were opened, Expedition 32 commander Gennady Padalka and flight engineers Joe Acaba and Sergei Revin welcomed aboard the TMA-05M crewmates, Malenchenko, Sunita Williams and Akihiko Hoshide, for their 5-month stay on the orbiting complex. 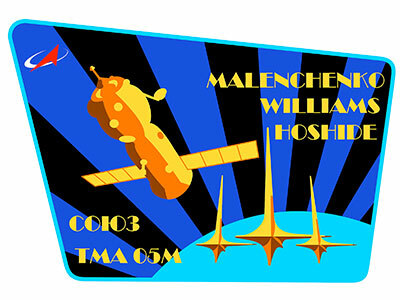 This marks Malenchenko's third long-duration stay aboard the station, after commanding Expedition 7 and serving as an Expedition 16 flight engineer, and Williams' second, after serving as an Expedition 14/15 flight engineer. This is Hoshide's first expedition on board the station. The Soyuz TMA-05M docking coincided with the 37th anniversary of the Apollo-Soyuz Test Project docking in 1975, which marked the first time international spacecraft joined in orbit. A record-setting female space station commander, a veteran Russian cosmonaut, and a Japanese flight engineer returned to Earth Sunday (Nov. 18), their Russian spacecraft descending under parachute to a pre-dawn landing in Kazakhstan after four months off the planet. The Soyuz TMA-05M capsule safely made it to the ground with NASA astronaut Sunita "Suni" Williams, Roscosmos cosmonaut Yuri Malenchenko, and astronaut Akihiko "Aki" Hoshide with the Japan Aerospace Exploration Agency on board. The spacecraft landed on its side at 8:56 p.m. EST (0153 GMT; 7:56 a.m. local time Nov. 19), an hour before sunrise near the targeted landing area located northeast of the remote town of Arkalyk.